My husband adores Thai food, so we often venture to local restaurants in search of a great Thai meal. We’ve found a few descent places, but none of them have really knocked our socks off. A few months ago I decided to teach myself some of the basics of Thai cuisine, so I could start cooking the dishes we love at home. 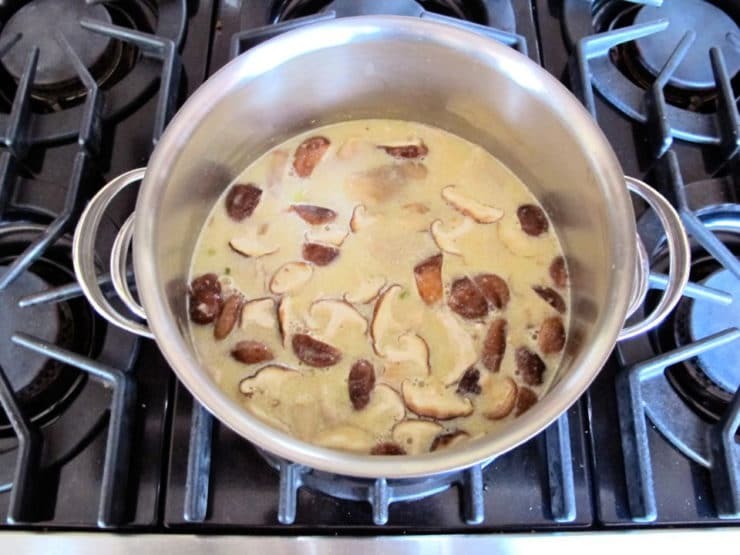 I started with my husband’s favorite Thai dish, Tom Kha Gai—spicy coconut chicken soup. Preparing Thai food can be challenging, because some of the ingredients are pretty exotic. I’m lucky to live close to a Thai neighborhood here in Los Angeles, but for those of you who don’t it can be tough getting hold of things like galangal and kaffir lime leaves. Kosher Thai cooking can present an even greater challenge; ingredients like red curry paste and fish sauce can be difficult to track down with a kosher hechsher. Red curry paste often contains shrimp, and fish sauce has anchovies, which presents a problem for some. Most Jews consider fish neutral, or pareve, but some kosher cooks will not mix fish with meat. Because of these challenges, I decided to create my own Thai-style soup using everyday ingredients. I wanted to capture that delicious Thai flavor in a recipe that is accessible to everybody, whether or not you live close to an Asian market. The most exotic ingredient on the list is lemongrass, which is available in the produce section of most American grocery stores. If your market doesn’t carry fresh lemongrass, it will likely carry lemongrass paste near the fresh herbs or in the Asian food section. If you can’t track it down, don’t worry—the soup will taste good without it, too. But if you can find the lemongrass, I highly recommend it– the herb has a distinctive flavor that really enhances the dish. 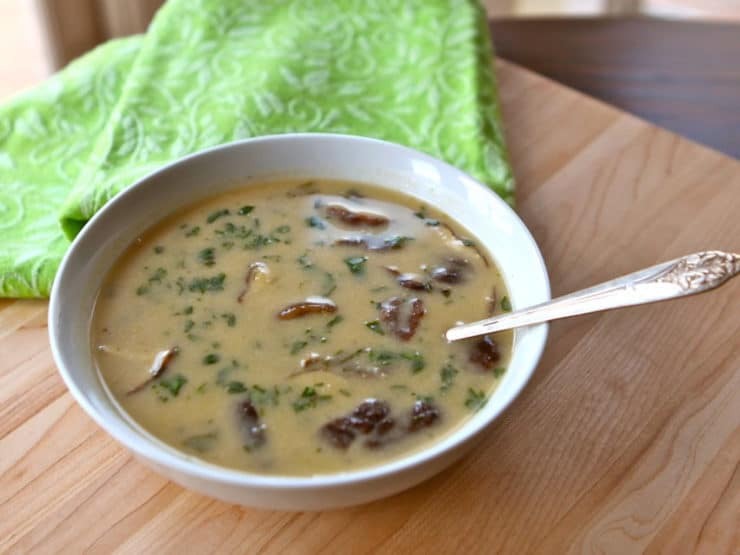 This soup is rich, creamy, spicy, subtly sweet, and full of flavor. If you’ve never tasted Thai soup before, you’re in for a treat… it’s really unique! Adjust the spice by adding cayenne to taste (it’s really spicy, so add with care). If you’re sensitive to salt, use a low sodium chicken broth. Add soy sauce to taste for more saltiness. 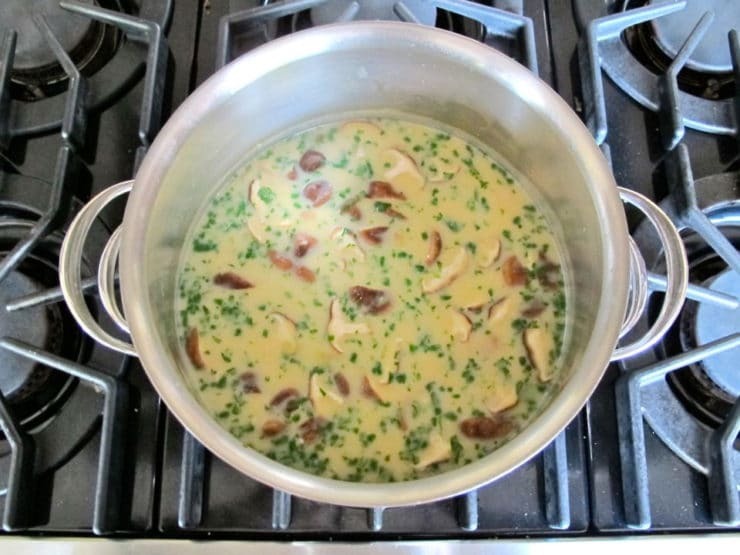 I like using light coconut milk in the broth to cut down on fat and calories; use regular, if you prefer. They both taste great. To make this recipe gluten free, make sure your soy sauce and coconut milk are certified GF. Many soy sauces contain gluten, but a few are GF certified– check the celiac forums online for recommended brands. 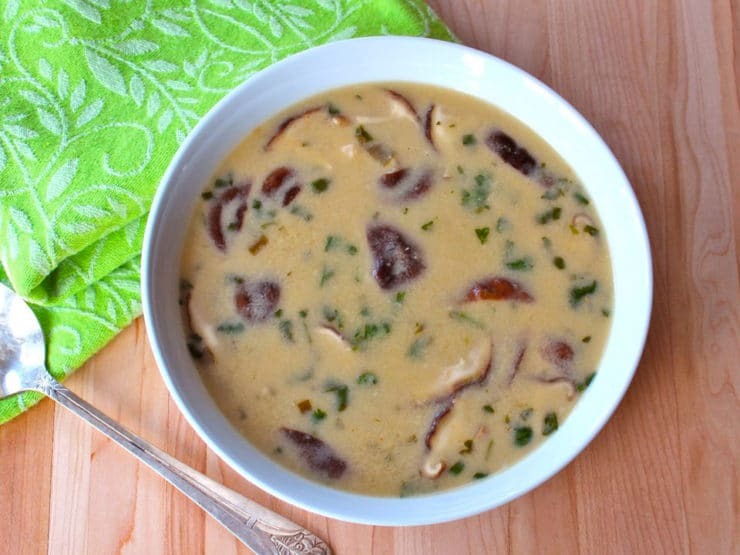 Recipe for Thai-Style Coconut Chicken Soup - tastes like spicy Tom Kha Gai, with everyday kosher ingredients you can find anywhere. Kosher, meat. Pour chicken stock in a large soup pot. Add the sliced chicken breast meat, sliced scallions, quartered lemon grass stalks (or paste), grated ginger, soy sauce, and cayenne pepper. Bring to a boil, then lower the heat to a simmer. Let the mixture simmer for 30 minutes. Add the sliced mushrooms to the pot and stir. Turn the heat to low. Shake the cans of coconut milk briskly before opening. Pour them into the soup and stir to blend. Stir in the sugar and lime zest. Slowly increase the heat, stirring constantly, till the soup reaches a slow simmer. 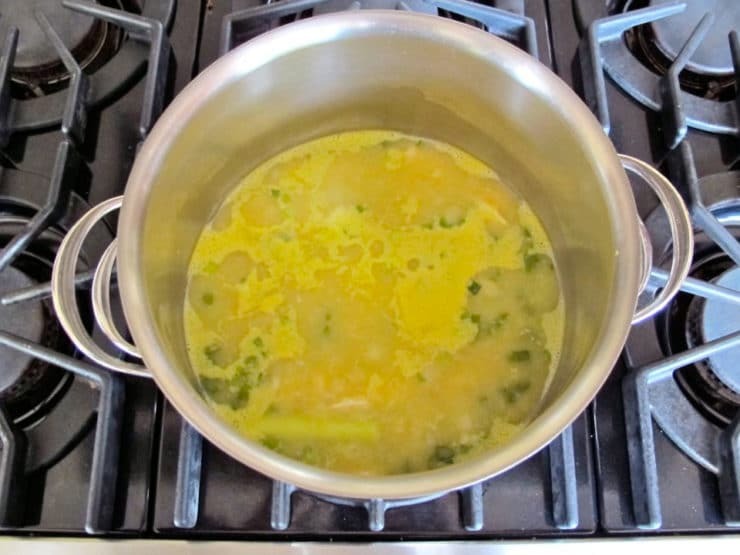 Keep the soup at a slow simmer for 15 minutes, stirring often; do not let it boil too briskly. After 15 minutes, turn off the heat. Stir in the fresh lime juice and chopped cilantro. Remove the lemon grass stalks with a slotted spoon. Taste the soup; add more cayenne pepper and/or soy sauce to taste. Serve hot. Can be poured over steamed white or brown basmati rice for a more filling meal-- doing this stretches the recipe to 8 servings or more. I’ve been making your Autumn Sweet Potato Soup for several years. It is a winter staple and I take it to Soup Day at my Weaving Guild. 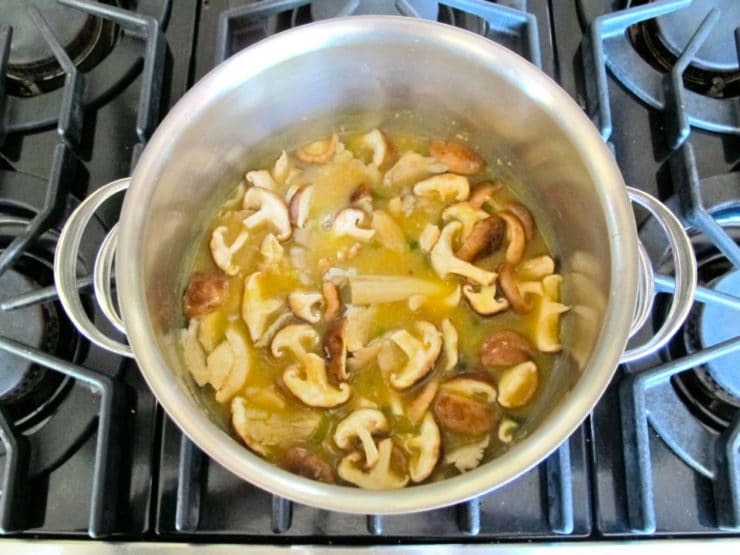 I would like to make this soup but cannot eat mushrooms. Do you or one of your readers have a suggestion for a substitute vegetable(s). thought of some Tofu but I think it needs more than that. Thanks so much! Hmmm, good question. Tofu is a good idea. Or maybe some peeled cubed eggplant? If using eggplant be sure to salt it in a colander to remove any bitterness, then rinse before adding. Add it at the same time you would the mushrooms – you won’t want to overcook the cubed eggplant or the soup will become mushy. By the way, I haven’t tried it– just trying to imagine the flavor profile and I think it would probably be nice. Fingers crossed! I just made this soup for my new husband and he really enjoyed it. He can only eat poultry so we needed a recipe without shrimp flakes or fish sauce AND he is a celiac. 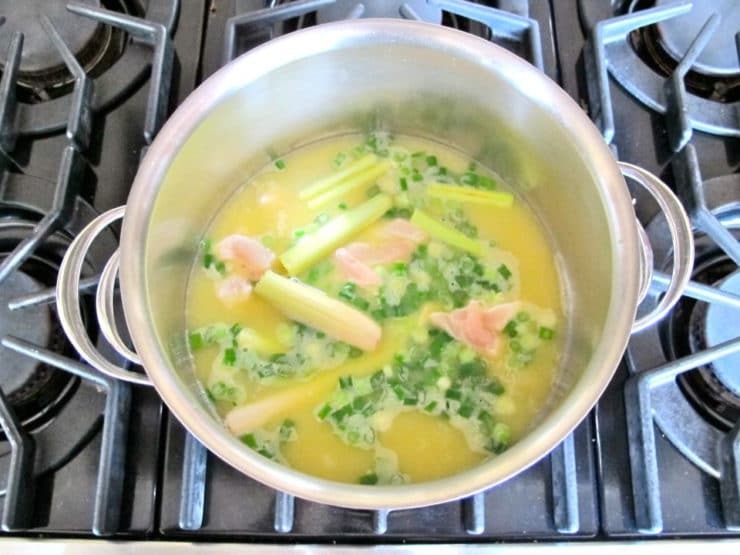 I followed this recipe but bought three stocks of lemon grass instead of two – and my husband said it tastes very lemony! So maybe next time I will use two stalks. It is a great recipe, tastes very very close to a Thai soup and was so easy. We will incorporate this into the permanent rotation!! Oh my goodness! This soup was absolutely delicious and not hard to make. I love that I could buy all the ingredients at my local supermarket. 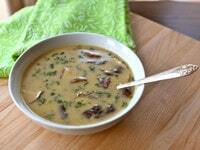 This soup, served over brown rice, will go on our regular rotation from now on! So glad you tried it and enjoyed it Lori! My husband and I, too, love Thai food. We try to find a new Thai recipe every week. Last week Kai (chicken) Tom Kurmin was our challenge. This soup is our next! Is the tablespoon of sugar essential? Is there anything else I could substitute? This soup looks wonderful. I love Thai food. Here in LA you can find some amazing stuff but if you want to refine it to your own taste making it at home is nice as well. This recipe is wonderful it’s really nice of you to make it accessible to everyone people need to be exposed to more out of the box cuisine. Lovely job Tori. Have a great week! My husband and I loved the soup! Thanks for sharing this recipe! This is definately a new Go-To soup for our house!! Made it tonight for my boyfriend and I, and It was super delicious. I had seconds! I did add a bunch more mushrooms though, just because we are such huge fans. Thanks! Very happy you enjoyed it Nikki! I really love the fact that you created a Thai recipe that any home cook can make without having to track down those not so easy to find ingredients – THANK YOU Tori! Hi! The soup does look delicious. Fish is always considered pareve, the only issue is that in the Shulchan Urech it states that there is somewhat of health danger to eat it with meat, and one should wipe and rinse their mouths between eating one and the other. 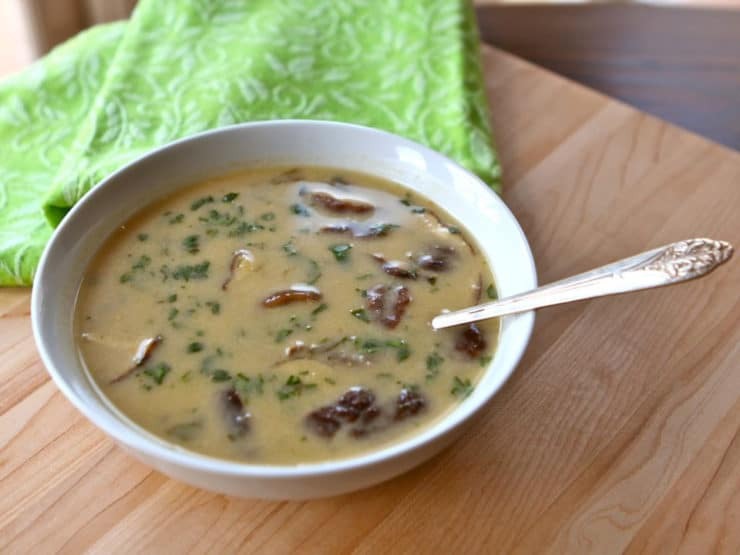 Thanks Tons will definitely try this creamy penicillin soup. Sadly, we only have two Thai places within 50 miles from my house, so I never get ‘knock my socks off’ Thai either T.T Which totally breaks my heart because I love it. Cooking it at home is a great alternative and yeah, those ingredients are crazy sometimes, but look at that beautiful bowl of delicious reward! It looks amazing! I’m really glad you shared a thai recipe. My boyfriend is jewish (and I’m not, so it makes me a real Shiksa lol) and I love cooking thai food for him, but like you said, it’s always a bit tricky to use Asian products because of their ingredients… Please, keep posting new thai recipes! it’s cool!! 🙂 And keep up with your good work, I looove reading it! Am I the only Jewish boy without a Thai cooking shiksa?! Can this soup be frozen? If so how long? Your soup looks delicious! How does it compare with what you get in a restaurant, tastes pretty close? Since you are using “everyday” ingredients I was wondering if you’ve tried the ‘non-kosher’ style with the ingredients from the Asian markets. This will be my new recipe this week, thanks! For those folks living in areas that Asian food is rarely made at home, unlike here in Hawaii, the fat in coconut milk has a tendency to coagulate if the cans sit on store shelves for very long time. Suggest soaking the can in the sink with hot water before using. My husband loves Thai food too. I should make this for him one of these soup nights. 🙂 He’d love it. I have a feeling my son would too. My daughter – who knows. LOL. And I don’t know that I’ve ever had Thai food…but this looks like a good place for me to start. Have a great weekend Tori! I make a soup close to this called Tom Ka Gai. It’s delicious and has a root similar to ginger called galangal and lime leaves. I love Thai food. When I lived in Settle there were dozens of restaurants that I frequented. I cant wait to try this recipe! Thanks! Tori, this is GREAT! I am a huge fan of this sort of thing….and I love that you broke this down to readily available items! Thanks and Shabbat Shalom! Hope you’re having a great weekend Ann! I’d like to try this in a crock pot, do you think it is possible? If so, what changes would be made to the instructions? Hi Shelley, good question. I’m honestly not sure how the coconut milk will hold up to the slow, sustained heat of a crock pot, I’ve never tried it myself. If you try it please let us know how it worked for you! This looks delicious! I’ll have to give it a try someday. I know you live in LA, although not sure which part. But…I used to go fairly often to a Thai restaurant on Pico near the corner of Pico and Robertson called Tuk Tuk. I remember that their food was pretty good. I haven’t been there in a few years, so not sure what the quality is like now, but it definitely used to be my favorite Thai place. Plus, it’s in Jewish central!